What Can Our Next Governor do to Protect Our Environment? The primary on May 15th gave Pennsylvanians their first opportunity to ensure there are voices in Washington D.C. who will be outspoken critics of the Trump Administration’s dirty war on health, air, water, and science that has included attempting to repeal the Clean Water Rule which protects nearly 10,000 stream miles in Pennsylvania and withdrawing from the Paris Climate Accord. It was also an opportunity make sure there are similar voices in Harrisburg where there are ongoing efforts to obstruct updated rules to control methane emissions from oil and gas operations and to rollback of protections to 1984 for shallow gas wells. Clean Water Action endorsed several candidates in congressional, state house, and state senate races that will be those voices. For U.S. House, it is exciting to see State Rep. Madeleine Dean in Montgomery County win the Democratic nomination, as she regularly had a 100% voting record on the environment in Harrisburg. For the State House, Sara Innamorato in Pittsburgh and Joe Hohenstein in Philadelphia are the kind of new environmental leaders that Harrisburg needs more of. And Rep. Chris Rabb’s victory in a hotly contested primary in Philadelphia returns one of the leading voices on the environment to Harrisburg. Clean Water Action is part of a community alliance in Southeast Pennsylvania organizing to convince SEPTA to end their use of fossil fuels and adopt a policy to transform the transportation system into one that uses 100% renewable energy. Adoption of such a plan would move SEPTA away from building gas powered plants in Tioga-Nicetown and other locations. It would also mean moving to an all electric bus fleet and expansion of the transit system, which studies have shown could reduce auto traffic on Route 1 by 380,000 cars per day. These measures would also improve air quality, create jobs, and advance environmental justice. Clean Water Action is continuing to address lead in drinking water, soil, and paint through community-based projects in Pittsburgh and Philadelphia. Lead exposure has long been known to have neurotoxic effects, especially on children’s developing brains. Childhood exposure can also cause developmental disorders, including lowered IQs and increased aggressive or violent behaviors. In Pittsburgh, the “No More Lead Pipes” campaign helps residents in vulnerable communities within the city learn how to identify lead hazards in their home and connect them with resources that can reduce their family’s exposure, including getting them to take advantage of Pittsburgh Water and Sewer Authority’s (PWSA) offer of free full lead service line replacements and the City of Pittsburgh’s program to provide free water filters to interested residents. PWSA is working to replace lead service lines for 2,000 homes this year, but many residents remain unaware of how to protect their families. Pittsburgh lead levels in drinking water remain over EPA’s level that requires utilities to take action to reduce lead exposure. Through our Lead Hazard Awareness Project in Philadelphia, Clean Water Action is continuing to conduct educational presentations to underserved and vulnerable neighborhoods. Similar to our efforts in Pittsburgh, the presentations provide information to orient residents on the hazards of lead exposure, to assist them in identifying whether there are sources in their homes and communities, and to provide them with paths to help them live safely with those hazards until they can be isolated or eliminated. Presentation attendees who are interested have an opportunity to become a designated Green Ambassador, who’ll be empowered to assist and instruct their neighbors in dealing with lead. In April, the second Green Ambassador Training was held at Philadelphia Community College. The program was spearheaded by presentations from State Representative Donna Bullock and resident Jana Curtis, both of whose children were exposed to lead poisoning. Green Ambassadors trained that day will take what they learned and apply it to detecting lead within their and their neighbors’ homes. 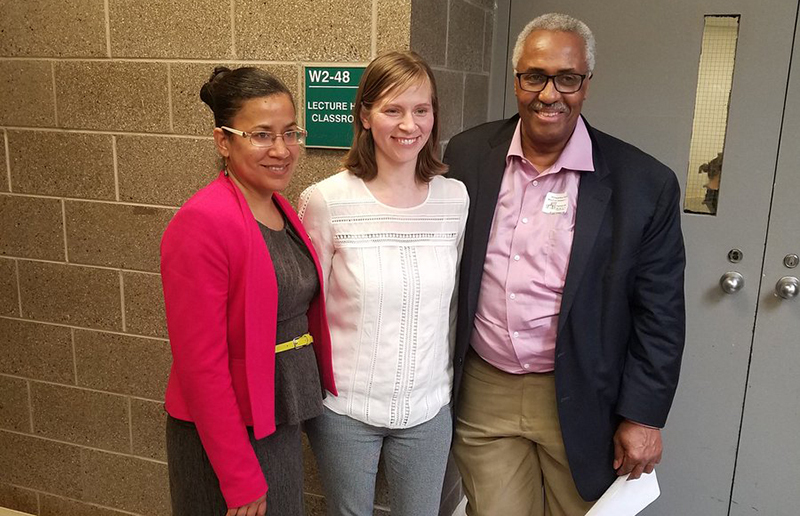 State Representative Donna Bullock, Philadelphia resident Jana Curtis, and Clean Water Action Eastern Pennsylvania Director Maurice Sampson at a Green Ambassador training. At the state level, Clean Water Action is pushing for adoption of legislation that would require universal testing of blood-lead levels in all Pennsylvania children under the age of two to determine who is at risk for lead poisoning and where children with the highest blood-lead levels reside. This effort emulates calls made last summer by Governor Wolf as well as a regulation adopted last year by Allegheny County. Movement on this issue stems from a Pennsylvania Department of Health Childhood Lead Poisoning Prevention Report, that found only 28% of children in the Commonwealth under the age of two were tested for lead in 2015 and over four thousand children (5% of those tested) had at least one elevated blood lead test result. Clean Water Action is fighting to ensure Pennsylvania has modern protections from modern drilling operations. This effort has two fronts, first working to get new protections from methane pollution from oil and gas operations, to protect our climate and our health. Second, to keep pushing back on the state legislature’s agenda of rolling back existing protections and oversight of the oil and gas industry, making it harder to pass and update safeguards for our air and water. Currently the state legislature is considering bills (SB 1088 and HB 2154) that would rollback protections to 1984 standards for shallow oil and gas drilling, despite violations from shallow drilling operations increasing to 1,834 last year, which is five times the number of violations as Marcellus Shale drilling operations. Preempting local government’s regulation of oil and gas activity. Exempting certain wastewater treatment facilities from water protection requirements. Removing a requirement that impacted water supplies are restored to Safe Drinking Water Act standards. Also being considered are a package of bills (HB209, HB1237, HB1792, HB1959, and HB1960) crafted under the guise of “regulatory reform”. These bills however don’t create a more efficient and effective government. Their real intent is to inject politics into a regulatory process currently based on science and greater needs to protect our health and environment. It also seeks to undercut the Pennsylvania Department of Environmental Protection’s (DEP) ability to effectively hold polluters accountable. Give private third parties the power to review and direct DEP to issue environmental permits. Establish a moratorium on new regulations, place a cap on the number of regulations, and require the repeal of existing regulations in order to pass new ones. Require each agency to appoint a regulatory compliance officer who would have the power to waive fines or penalties if the polluter is “cooperative”. Instead of making it easier for polluters to operate, our state government should be advancing efforts to address climate change by introducing regulations to control on methane emission from the 10,000 fracked wells and oil and gas operations already in existence. 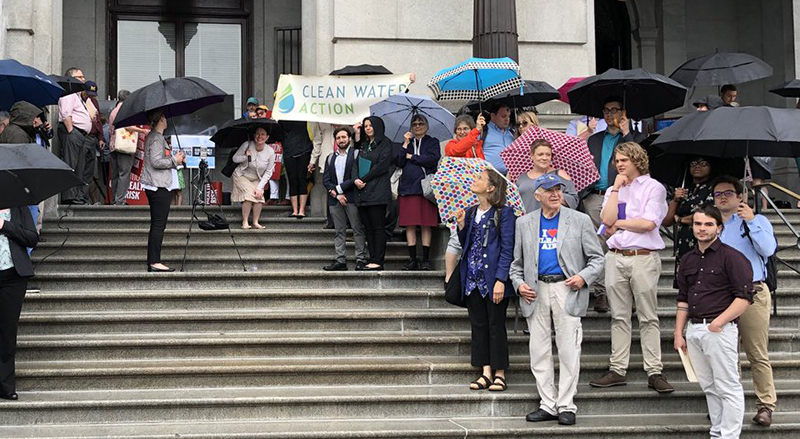 Clean Water Action delivered this message directly to legislators when residents from across Pennsylvania traveled to Harrisburg on May 22nd for a day of grassroots lobbying. The day was punctuated by a rally on the Capitol steps that featured impacted residents, medical professionals, and kids. Activists also delivered several thousand comments from Pennsylvanians to the governor letting him know they wanted more protections from oil and gas operations. Clean Water Action and allies rallying outside the state capitol for commonsense protections from oil and gas operations. Clean Water Action recently celebrated a victory for clean air in Pennsylvania. Thanks to your support, Governor Wolf and DEP recently announced finalization of permits to control air pollution from new natural gas operations. These landmark permits will control 98% of methane emissions, a potent greenhouse gas, which contributes to climate change and poses a significant public health risk. They will also bring Pennsylvania in line with other leading natural gas states and will cover more sources than federal rules. Governor Wolf first announced his intent to reduce methane pollution in 2014 and formally introduced his reduction strategy early in 2016. Allegheny County residents are in the top 2% nationwide for cancer risk from air pollution. In communities downwind from major industrial polluters, childhood asthma rates are more than triple the national average. Changing this trend means doing more to hold polluters accountable, reducing emissions, and investing in impacted communities. Allegheny County Health Department (ACHD) took steps toward implementing these solutions when they approved updates to their civil penalty policy. These updates increase fines, call for harsher consequences for polluters that impact vulnerable communities, and encourage fines to be used on programs that would directly improve the environment and public health in Allegheny County. While this new policy holds promise, it also contains loopholes and areas for improvement that need to be addressed in order to ensure this policy is effective and actually works for residents. To increase transparency, accountability, and prevent abuse by polluters, Clean Water Action is calling on ACHD to ensure fines used for community projects improve the environment in impacted communities, and release quarterly reports that outline all of the air quality exceedances and violations and how each of those infractions were enforced. And most of all, ACHD needs to actually use improved policies to get violations to end at chronic air pollution violators like U.S. Steel’s Clairton Coke Works. After thousands of documented air pollution violations, ACHD reached an agreement in 2016 that gave U.S. Steel three years to fix the problems at their aging coke plant. With violations still ongoing, ACHD needs to take action that is effective in ending these violations and cleaning up our air. Clean Water Action joined 25 environmental organizations to identify Pennsylvania’s most pressing environmental challenges and develop the first Pennsylvania Common Conservation Agenda, solutions to these challenges that the next governor could enact. The solutions covered eight areas: Ensuring Environmental Justice for Vulnerable Communities, Restoring Funding for DEP, Improving Protections from Threats by Natural Gas and Petrochemical Infrastructure, Protecting Drinking Water Supplies from Source to Tap, Boosting Investments in Growing Greener, Strengthening the Commonwealth’s Workforce through Green Jobs, and Bolstering the Commonwealth’s Clean Energy Sector. Clean Water Action will be working with partners to educate candidates running to be our next Governor and demonstrate the public’s support for this Common Agenda.